In the latest development in Ethiopia's space ambitions, the country is set to launch its first earth observatory satellite in September 2019. Addis Ababa will use the satellite to collect data on changes in the climate and weather-related phenomena. Officials from the space agencies of both China and Ethiopia met earlier in the year to advance talks on technological transfer and sign cooperative agreements on space activities. The capsule of the envisaged earth observatory satellite will cost US$8 million to design and build. China will take up US$6 million of the cost. The satellite will be launched from China, but the command and control centre will be based in Ethiopia. Dr Solomon Belay Tessema, senior scientist and director-general of the Ethiopian Space Science and Technology Institute at the Addis Ababa University, said in a statement that the launch had two main goals: "The first one is [to] build the technology application capacity and skills of our engineers through collaborations with different countries' space scientists and institutions, so that they will be in a position to design, build and launch the second satellite independently. The second one is the direct support the first satellite gives to social and economic development in terms of saving the money the country is currently spending on buying data, such as climate data." "Most of the preliminary and critical design is done by our scientists," he added. Aside from financial support, China will also provide training and facilitate all aspects of the satellite's launch. Speaking about the Ethiopian engineers involved in the launch and design of their country's first satellite, Tessema said, "We use home-based strategy, which involves local engineers and students at MA and PhD level to be part of the science and applications of the technology and knowledge transfer." This is the latest in a series of expansions of Ethiopia's space ambitions. Last year a privately funded, multi-million-dollar astronomical observatory was launched in the Entoto hills overlooking Addis Ababa to allow Ethiopia to observe the skies of both the northern and southern hemispheres. China is continually deepening its foothold in the African arena. Cementing its role in the space business and providing space mapping services is part of Beijing's global Belt and Road Initiative, with both state-run and private Chinese space companies selling made-in-China satellites abroad. 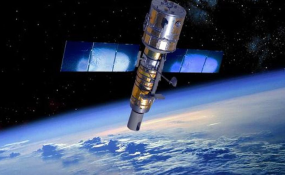 Its technological transfers to Africa are under scrutiny, with experts warning that the digital systems could be used for Beijing's intelligence operations and electronic surveillance, while Ethiopia could potentially use the satellite to boost its military and surveillance might. The African Union has introduced an African space policy, which calls for the development of a continental outer-space programme and the adoption of a framework to use satellite communication for economic progress. The report for the Second Ordinary Session for the Specialised Technical Committee Meeting on Education, Science And Technology (STC-EST) stated, "Science, Technology and Innovation Strategy for Africa (STISA 2024) is an important intervention for using science, technology and innovation to respond to the continent's priorities. It is clear that space science and technology is an important tool for ensuring the sustainable use of natural resources and the creation of high-technology industrial sectors. Furthermore, it makes a considerable contribution to the creation of enabling environments for addressing a wide range of pressing challenges, including the need to create jobs, reduce poverty, manage resources sustainably and develop rural areas. A formal space sector will assist Africa to realise the vision of a peaceful, united and prosperous continent."